As I come out of my winter slumber and start seeking photo opportunities, daffodils are usually one of the first signs of spring here in the mid-Atlantic area. 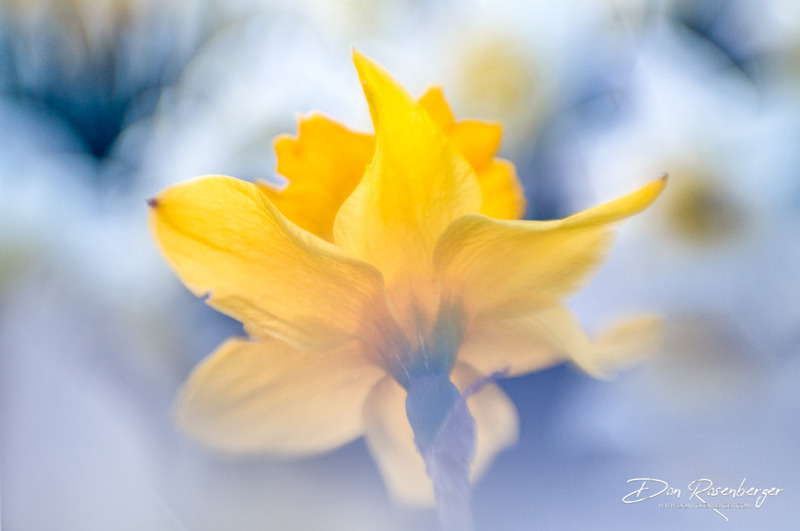 Recently I was in search of a daffodil image from my old blog that is hosted on the Blogger Platform. The reason for such a search was I recently decided to move my blog from the Blogger Platform to my WordPress based website. Of course I wanted a picture to accompany the announcement that the blog was moving. I had to go pretty far back in my Lightroom catalog to find a daffodil image, so that got me to thinking that I needed to get outside and take some new daffodil images. The first few days after I had this thought the March winds were making their presence known and so my quest to shoot some daffodils was postponed. Finally a couple of days ago the winds were calm enough to finally get out and make some images. My favorite from the hour or so shooting before sunset is the blog picture above. I used a Lensbaby Composer with the aperture ring removed (for maximum softness) and then used the technique of shooting thru. That is I had white daffodil pedals touching the edges of my lens to create a soft white border around the solo yellow daffodil. By the way, the main reason I switched over to hosting my Blog here is it’s easy to post a gallery of images, something that was not easily done on Blogger. Sorry no gallery this time around, but my last post of the Silk Mill has a number of images and some future blogs will have galleries of images as well. This entry was posted in Uncategorized and tagged Daffodils, Flowers.